Oh the Hypocrisy of the Party on the Left !!!!!!! Leftist have a very short memory and it is on parade everyday !!!! What a Great Cartoon to expose the Liars of the Left !!!!!!!! Pelosi and Schumer should step up to the microphone then explain their proposal to protect the people of America. 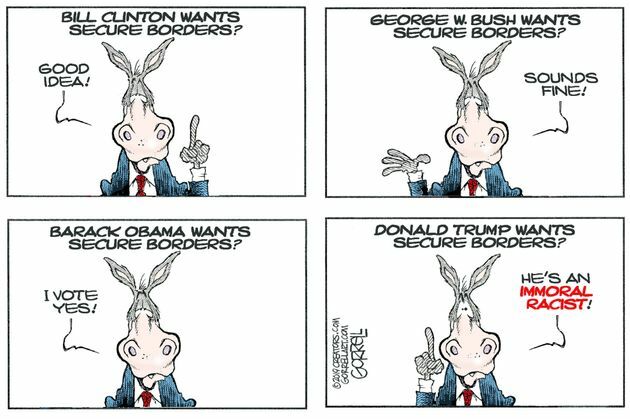 They have no proposal to secure the border. Their only objective is to stay in office and get paid, and the left is now open borders, so they think that's how they stay in office and get paid. The question that rises to the top is how many millions of illegal aliens are the Demorats going to pay for with their money.